Steel production on Teesside has ceased after SSI mothballed the Redcar works following a global downturn in the price of steel and later announced its UK arm had gone into liquidation. But what became of the company that founded the plant almost 100 years ago? Monty Python's Michael Palin has been from pole to pole, circumnavigated the world in 80 days and traversed the entire Pacific Rim but - until last week - he had never been to Middlesbrough. So how, when he did eventually make it to Teesside as part of his Thirty Years Tour, did he introduce himself to the men and women of Middlesbrough? By expressing his admiration for engineering firm Dorman Long - gone from Teesside but not forgotten. From a small railway station in Brazil to one of the icons of Australia, the writer and actor has discovered the company's name around the world, he told the audience. The company was responsible for the harbour bridges in Sydney and Auckland, river crossings across Africa as well projects closer to home such as London's Lambeth Bridge, the Tyne Bridge connecting Newcastle and Gateshead and Middlesbrough's Newport Bridge. Dorman Long was a key player in the British Empire construction trade along with another Teesside firm, Cleveland Bridge and Engineering Company. "Dorman Long and Cleveland Bridge together produced most of the steel structures and bridges around the British Empire," said David Dyer, managing director of Dorman Long Technology, the modern firm derived from the original Dorman Long. "From India to Africa, Australia to Asia, the Dorman Long name can be found. "After the terrible earthquakes in Nepal (in April), we were contacted by somebody who found the company's name stamped into metal in one of the damaged buildings." Metal production started on Teesside in the 1840s following the discovery of iron ore in the Cleveland Hills. The burgeoning industry saw the population boom from just 40 in 1929 to more than 5,400 12 years later. 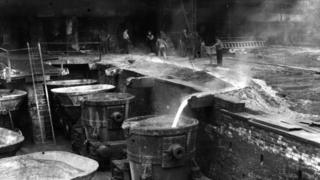 By 1865 more than 30 blast furnaces were operating within a six-mile radius of Middlesbrough with about 1m tonnes of iron being produced a year. In 1876, 28-year-old metal worker Arthur Dorman launched a partnership with Albert De Lande Long making iron bars and angles for ships. In the 1880s Dorman Long started making steel and over the following years bought several other firms and work sites around Teesside. By 1901 the firm employed about 3,000 people and produced 180,000 tonnes of finished material a year. When World War One started in 1914 Dorman Long had 20,000 workers and, after becoming a major manufacturer of shells for the war effort, started building a £4.5m plant at Redcar. The Redcar works opened in 1917 and Dorman Long competed for and won numerous large-scale projects around the world. One of their chief competitors was Darlington-based Cleveland Bridge and Engineering Company which launched in 1877 and went on to build numerous bridges including the Tees Transporter Bridge and the Victoria Falls Bridge across the Zambezi river between Zimbabwe and Zambia. Dorman Long won the contract for the Sydney Harbour Bridge in 1924 and completed the crossing eight years later. In that time the company bought Bolckow, Vaughan and Co which, in 1841, had opened the first ironworks on Teesside. In the late 1940s Dorman Long turned its hand to building railway engines and by 1956 the company owned numerous steel, engineering, chemical and construction works around the UK. In 1967 the company merged with 13 other steel manufacturers, who between them made about 90% of the nation's steel, to form the nationalised British Steel. In 1990 Dorman Long merged with its one-time competitor Cleveland Bridge, while the steelworks remained with British Steel. Now Dorman Long Technology is based in Northamptonshire and provides tools technology to firms building large construction projects. Recent projects include London's Wembley Stadium, the Honam high speed railway in South Korea and the Estadio Nacional De Brasilia in Brazil. But what became of Dorman Long's previous projects? One of their closest to home, Newport Bridge, still operates as a bridge for vehicles and pedestrians although the vertical-lifting deck has been permanently fixed down. The bridge, which links Middlesbrough with Stockton, was completed in 1934. Australia's Sydney Harbour Bridge is one of the most famous in the world. "Schoolchildren in Australia are still taught the name Dorman Long," said Mr Dyer. And other Dorman Long bridges can be found crossing the Nile, connecting Danish islands and in far-flung reaches of the British Empire such as Hong Kong. Though its former steelworks may face one of its greatest crises, Dorman Long's bridges continue to connect the world.